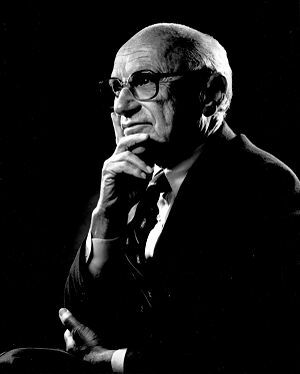 Milton Friedman (1912–2006) was an American economist who believed in monetarism. Monetarism is the theory that how much money the government prints each year has a huge effect on the economy. He supports the government printing the same low rate of money each year rather than a different amount each year. During the 1970s, Milton Friedman's idea of monetarism gained popularity and he became an economic advisor to President Ronald Reagan. Friedman believed that the government control over the economy should be limited. He supported cutting taxes, lowering government spending, getting rid of government rules that limited the economy and letting parents choose which school their taxes paid for. His political views were libertarian. He was against forcing people to join the army, and said that getting rid of the United States' policy of doing that was the thing he was most proud of doing. Throughout several decades, Friedman made many documentaries, books, and interviews to express his views to the public. The main books he wrote were Capitalism and Freedom and Free to Choose. This page was last changed on 6 March 2014, at 00:42.